Special discount for direct booking from the above published rate. Rates are Single or Double Occupancy. Extra person charge of IDR 300.000 per person, per night. Include extra bed and extra breakfast. Children up to 12 years stay free unless an extra bed is requested. Special package for group of 15 – 30 pax or other package deal, please email us directly. "A wonderful place to just relax !!" Rooms were so comfortable and very large. The infinity Pool had amazing views over the valley and rainforest. The staff were very friendly and attentive. 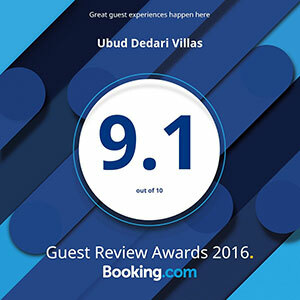 My boyfriend and I stayed at Ubud Dedari Villas for 2 nights in May 2015 and were blown away by the beauty. What we liked most: - Absolutely beautiful, big and clean rooms with everything you need: very comfortable bed, and big and clean bathroom - Stunning surroundings: the views and sounds from the room and balcony made you feel really immersed in the peaceful rainforest - Beautiful infinity pool with an incredible view - Great walk through the rainforest to Goa Gajah Elephant Cave - Lovely and very helpful staff, particularly Gustu and Poernomo - Shuttle service to Ubud (10min) - Breakfast was ok, banana pancakes were delicious! A highlight for us was the staff accommodating our request and helping to arrange a day for us visiting Gunung Kawi Temple, the Holy Water Temple and Tegalalang Rice Terrace. Poernomo drove us all day and stopped and explained so much to us, sharing his experiences and insight about the local culture, history, customs and sites. We highly recommend Dedari! "Very peaceful and totally relaxing"
Very peaceful and totally relaxing. All the staff friendly and nothing was too much trouble including room service of meals. Poernomo, the manager, made sure he gave his personal attention to all the guests. Would definitely be back again. "Great staff. Great views. Quiet and peaceful"
The staff were amazing. Bigger rooms than expected. Large open feel bathroom. Had a great time and would recommend to anyone on their honeymoon looking for somewhere out of the city with culture and freedom and peace.